This entry was posted on October 8, 2010 by Phil Groom, in Christian Suppliers, News and tagged CBC Preston, Christian Bits, Golden Ticket, Nathan's Leather Goods, Soft Approach, STL, STL Distribution, STL UK. Bookmark the permalink. We were overwhelmed with the generous gift that the Gold Envelope represented for us as a business, we offer our sincere thanks and appreciation to STL for this gift. It is great that we still sell many Bibles from both our shops, so we decided to use the gift to buy in Bibles. The gift of the Gold Award has allowed us to stock up with a broader range of Bibles that can be offered to our customers. 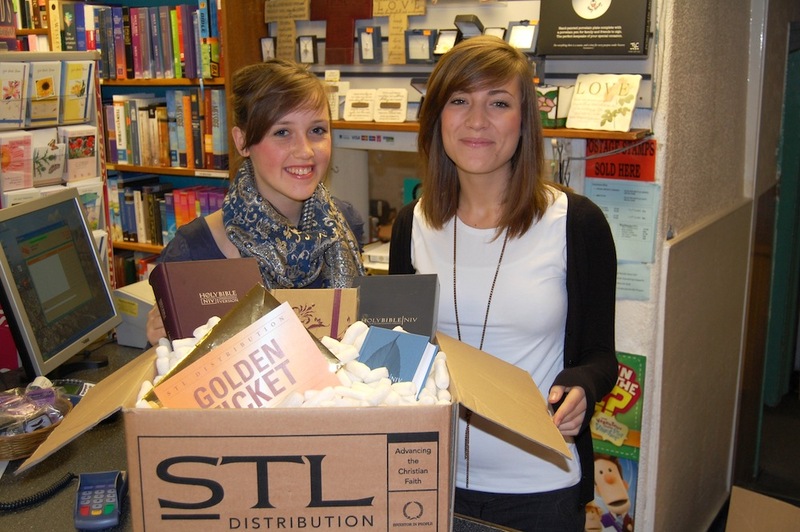 If you’d like your store to be in with a winning chance, simply keep those orders rolling in to STL. The rules are simple: to be in with a chance for the Golden Ticket, worth £500, place an order for £250 or more; for the Silver Ticket, worth £300, place an order for £150 or more; and for the Bronze, worth £150, place an order for at least £75, the old carriage-free minimum. Remember, all orders remain carriage-free until further notice from STL.